I would probably suggest looking at email communications/newsletters like mail chimp plugin or similar since they may have tracking features. The basics is RSS feeds incorporated in emails should accomplish this in plugin you find. Also there seems to be an issue with Group Activity on the Group Home. Even though updates are posted in the Single Group. Testing this on Local Install using TwentyFifteen Theme. Additionally has @espellcaste mentioned its best practice to do so. @jgwolfensberger has @mercime indicated it good to go. Thanks BuddyPress Team for all your hardwork. I would encourage you James to have a local install especially if you attempting to configure BuddyPress. It has an extreme learning curve to configure it for your particular community needs. In my opinion, easier to create demo members/groups..,etc to see the settings work and perm ink structures you need to set before going n live site. @godavid33 Just thought I would comment because you bumped your post. What I understanding bumping a post shows topics have been respond too. Unfortunately, I am unable to help you because completely out of beginner knowledge but I did go back & look at all your post on the forum. I am trying to understand the logic in all the customization when BuddyPress natively provides notifications. 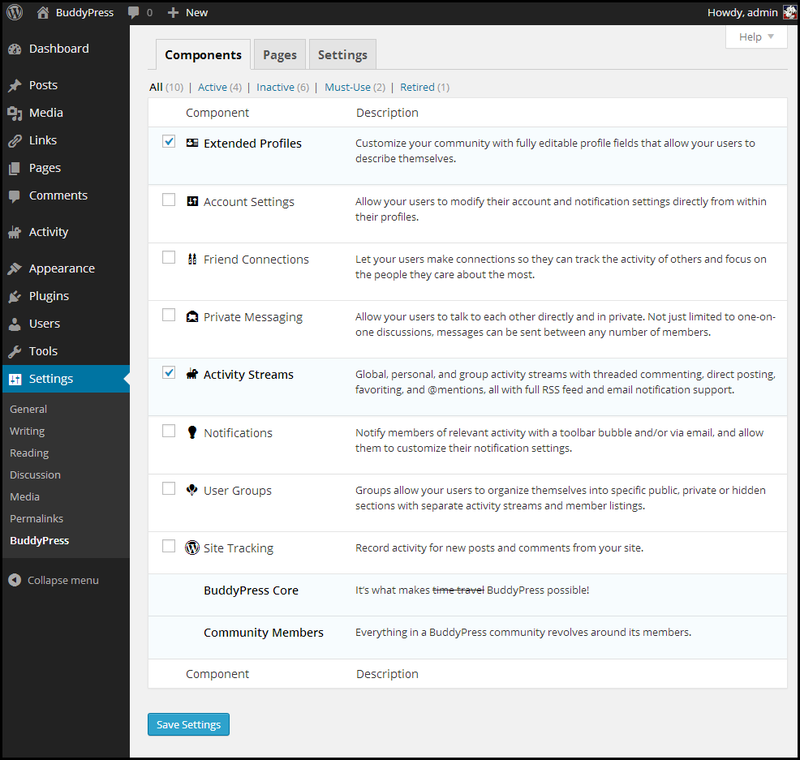 @antimuffin are you referring to extending profile fields. If so here’s the link for that which supports drop down select. however unsure if it supports conditional/dependent fields. You may have to look into a plugin. @mth75 what other plugins do you have installed. You may also want to check out this plugin https://wordpress.org/plugins/social-articles/ heard great things about it but haven’t used myself. Did you check with BuddyBoos maybe they would know better. I did go to search since I don’t know Dutch I searched “Jupiter”. & got sent to activity page than try to show Posts but nothing for the results. Maybe look at your widgets for search posts. Also it could be something with you making your home page something other than a static page and/or recent blog posts. BuddyBoss are suppose to be great so I would probably ask them. multisite install by default allows users to login with same info. you may also want to post over on wordpress support forum for multisite. I was reading so article & now don’t remember that subscriber on multisite don’t automatically become members which confuse me know. I am pretty sure there is probably login redirect plugin but haven’t used any to recommend. I am also unfamiliar with commerce sites but do you want to redirect someone before they complete their purchase to buddypress. I think multisite forum may be could more helpful and to be honest I thinking of just going back to single installs & migrate later. I have multiple sites like you too with various focused it has been challenge wrapping my head around it all. @jacqueschoquette Buddypress does not utilize it own forums but uses bbpress.org for them. Thanks @henry for referencing… I had thought to refer to something but was cautious on my experience; further, replying just via mobile phone. @robertnorcross I thought I would comment because I understand how difficult to attempt to put all the pieces together. I feel you because have encountered similar issues with understanding how to create /separate / map to others domains however it would be most useful to understand your bigger picture of how it flows contextual for your sites. I.E what is example1.com, example2.com, example3.com (buddypress community)relate in context and/or content. 1. Do they relate or more about styling/theme. 2. Do you want the users database to be separate from the over all install. 3. Why, What & Who is the purpose Of your community. All the following could best help the community in understanding of what you attempting to create additionally the logic behind your websites so that we can point you to either plugins, resources and/or references. It’s simply extremely hard to help when everything is so ambiguous. I am unsure of the code to search/query results of users but based on he analogy you presented in imputing a # number to show suggested match. I would think is easily possible by echoing out member/user Data id #. That would be my thought, suggest maybe looking /googling for user meta and how to use them. @cuisire_ceo It depends but found the following most useful after googling so much to only come up with garbage past dated scraped/syndicated content. Tammie Lister @mercime http://wordpress.tv/?s=tammie have some great talks and also have just googled for any slides from the various presentations. If not able to see video. or anything Boone from Youtube via WordPressNYC great example http://www.youtube.com/watch?v=gPpU3ySo5q0 in understanding of GROUPS. So you probably thinking Wow but you have not answered anything on installing 🙂 Believe me it helps so much to think big picture of your whole community than start working backwards as single page/components to map similarities to constructed it.
. I know what you thinking this is not my intent or not relevant. Start watching #2 at 2:16 to think in context of Simalirty. and Mathis on VIMEO. The biggest problem is finding the resources in a central location so I have to track down. I would think you could use the normal import/export wordpress plugin as long you have the buddy press installed. How much do you needing to export to import. Not sure but Did you confirm your WordPress Settings https://codex.buddypress.org/getting-started/register-and-activation-pages/ having Membership Checked.